Well it has been the wettest and greyest winter since we arrived here – not so cold, but without many sunny days rather more depressing. We've been taking Finn out as much as possible to get him socialised, he's coming on pretty well. One trip to Brive proved a little too much – it was the day that the carnival came through town. Everyone throws confetti at all the floats – a bit too exciting for an Irish Wolfhound Puppy. We found some youngsters dressed up for the occasion – one of them as a wolf. I think that he eventually understood my explanation of what a wolfhound was bred for, but he refused to actually be hunted. Still not totally sure he appreciated my sense of humour – not alone there then! 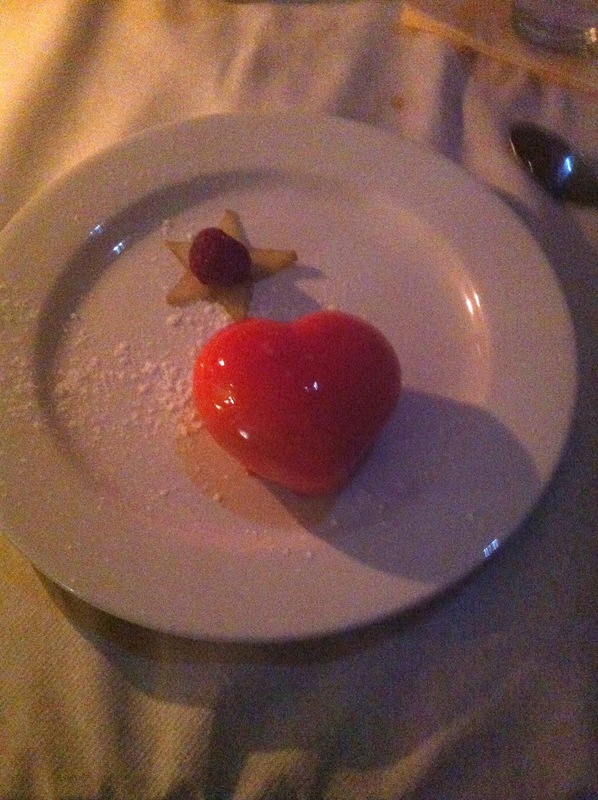 For Valentines day we had a lovely dinner at the auberge, heart shaped dessert and all. We were even given our engraved aperetif glasses as a souvenir! On our travels we have now found an American cafe in the small town of Excideuil, about an hour away. Nice people running it and a welcome bit of variety. Talking of Finn – to answer the usual questions I am asked when I am out with him, I have had a special sweatshirt printed – seems to help! I got in touch with a friend who lives near St Emilion and has his own commercial vineyard to ask why apple orchards were netted against hail, but vineyards aren't. Still not sure of the reasons – but he told me that he was selling the vineyard, and offered me a couple of boxes of wine for free. I had a nice drive to see him, gratefully accepted the wine and bought a couple more boxes – and very good it is too. Judy and I then treated ourselves to a short break in Venice to celebrate our 45th wedding anniversary. We flew from Toulouse, and had five very enjoyable nights. The B & B we stayed in is a lovely old house dating from the 15th century and furnished with antiques right on a bend in a canal. In fact it's name Ca Malcanton means the palace on the dangerous bend! We walked around a lot, went to lots of museums and art galleries, took some trips around the lagoon and generally had a wonderful time. Oh, and we ate far too much! One surprising highlight was the cemetery island of San Michele – a fascinating place to explore. Back home and picked up the dogs – as always when Debbie looks after them they seem to have had a wonderful time! We are still trying to get out and explore the lovely area we live. We recently took a picnic to the Lac de Vassiviere, about an hour north of us. A beautiful large lake, which probably gets very busy in the tourist season. As there was a bitter wind blowing we had an excellent lunch in a hotel looking out over the water, and took the picnic home. I had a couple of nights away in Bergerac for the AGM of SSAFA France and some training sessions. Very enjoyable socially, and I did learn quite a lot, but the Data Protection lectures were hard work! Judy got me up (comparatively) early one morning as Finn had ripped up his bedding in cage and wound it all round one hind leg. He then tried to get out of the cage through the hinge side of the door. Bless him he kept very still while we spent 15 minutes carefully cutting him free. He never snarled or growled once . The cage is now in the cellar and he sleeps on a single mattress we had spare! Fabio the chef at our village Auberge likes to have themed evenings every so often. We gave the Tete de Veau a miss, but the 7 hour cooked lamb sounded wonderful – and it was. Only two slight reservations about the evening; it was supposed to start at 20:00, we started at 21:30 so didn't finish eating until 23:00. Then it was Fabio's birthday, so we all had to have a piece of birthday cake and a glass of prosecco. We got to bed about midnight and my digestive system protested a little! At last we've bought a new car – new to us that is. It's a Renault Grand Espace and the dogs love it. There is so much room in the back Finn doesn't lie down – he just keeps on walking. It drives very well and has a few of those modern touches such as automatic wipers and a built in Satnav. Bliss!